You are here: RTI Wiki » Right to Information Guide » Guidelines for RTI Applicant » RTI Forms » Who can ask for information under Right to Information? Any citizen can ask for information under these laws.The Act extends to the whole of India except the State of Jammu and Kashmir. OCI's (Overseas Citizens of India) and PIO's (Persons of Indian Origin) card holders can also ask for information under the RTI Act. For citizens, OCI's and PIO's who are staying out of India, the RTI Application can be filed with the PIO of the local Indian Embassy/Consulate/High Commission and they will inform you regarding the amount of application fee in local currency as well as the mode of payment. It is quite interesting to note that even though under Section 3 of the Act right of all citizens, to receive information, is statutorily recognised but Section 6 gives the said right to any person. Therefore, Section 6, in a sense, is wider in its ambit than Section 3. (Observed by Supreme Court of India: CIC .Vs. State of Manipur) RTI Act does not define PERSON. However, The General Clauses Act, 1897 defines PERSON as Person“ shall include any company or association or body of individuals, whether incorporated or not, “Political Agent” shall mean- In relation to any territory outside India, the Principal Officer, by whatever name called, representing the Central Government in such territory, and in relation to any territory within India to which the Act or Regulation containing the expression does not extend, any officer appointed by the Central Government to exercise all or any of the powers of a Political Agent under that Act or Regulation. Thereby, another organisation can ask for information from another organisation. Irrespective of the nature of the job a person may be performing as far as a person is a citizen of India he/she shall have the right to information subject to the provisions of RTI Act. 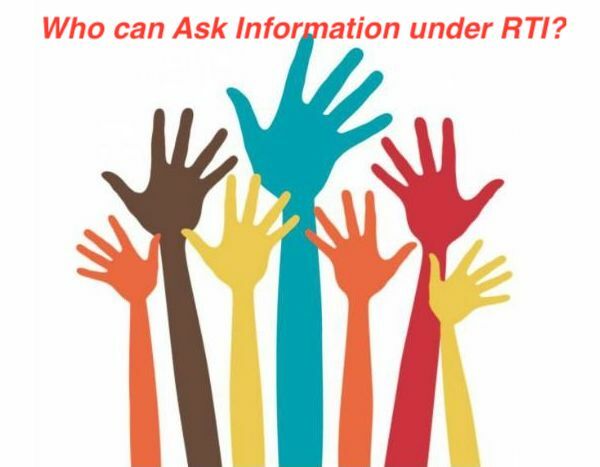 ALL citizens are entitiled for information under RTI, which includeds employees. Same is clear from S. 6(1). It starts with non obstinate clause 'A person'. So it is the person matters not the employability or employee. The application/ appeal from an Association or a Partnership Firm or a Hindu Undivided Family or from some other group of individuals constituting as a body or otherwise is to be accepted and allowed. Kolkata high court has allowed use of post box in filing RTI which shall enable contact of a user with the authority without revealing personal details of the information seeker. You do not need to worry about your safety when Post Box is there. Created by shrawan on 2015/08/22 13:51.